Michael Bard is an active musician, composer and teacher who resides near Washington, D.C. He has performed as a soloist and with various musical ensembles throughout the United States, Europe, Japan, North Africa, South America, and the Middle East. He has also been featured on various radio and t.v. programs around the world. He has served as Vice President of the Dayton Classical Guitar Society as well as Vice President of the Washington Guitar Society. While pursuing graduate studies at Arizona State University, Tempe, Michael was awarded a full scholarship to study at l'Accademia "Ottocento" in Vigevano, Italy, a school which specializes in the classical guitar music of the 19th century. During that time he also participated in a concert tour of northern Italy and Switzerland. Michael has also performed as rhythm guitarist for Higher Octave/Virgin recording artists Shahin and Sepehr with whom he has toured nationally and abroad. He also appeared on their fourth cd "World Cafe" which peaked at #18 on the Billboard New Age charts and was featured on NPR's "All Things Considered." 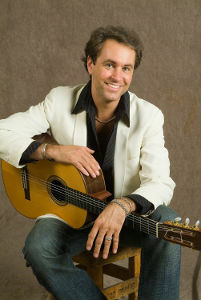 As a performer, Michael was chosen by the U.S. State Department to concertize throughout Yemen, Saudi Arabia, Jordan, Bahrain, and the kingdom of Morocco with fellow guitarist Corey Whitehead. Billing themselves as 'Douze Cordes' Michael and Corey effectively served as cultural ambassadors, offering diplomacy through music. They were later invited to give more performances in Jordan and Kuwait on a second tour again sponsored by the U.S. State Department. More recently they embarked on an 11 city concert tour throughout the country of Chile, this time as a trio with vocalist Deborah Benner, Michael's better half. Michael has performed for many luminaries and dignitaries including former President Bill Clinton, former Vice President Al Gore, United Nations Secretary General Kofi Annan, former Joint Chief of Staff and former Secretary of State Colin Powell, President of Mexico Vicente Fox, Senator Patrick Leahy (D-VT), Senator John Kerry (D-MA), Teresa Heinz, Henry Kissinger and former Senator Bob Dole(R-KS) as well as various members of royalty throughout the Middle East. His first recorded solo effort entitled 'Illumination' features original compositions for guitar and solo piano, blending a soothing mix of of Spanish, Latin, and adult contemporary instrumental styles. His composition 'Mediterranean Beauty' for two guitars is published by Lathkill Music Publishers, England. Michael holds a Masters degree in music from Arizona State University, Tempe and a Bachelors degree in music from Wright State University, Dayton, OH.